Abstract: The paper offers a survey of geological profiles of Quaternary sediments in the neighbourhood of Topolovnik and Golubac. The profiles are composed of loess, loessoid sands, and quicksand. In the area of Topolovnik, Quaternary sediments overlying Pliocene sediments contain terrestrial fauna of molluscs (gastropods). These layers are more than 10 m thick. The neighbourhood of Golubac and the town itself lies partly on Badenian and partly on Quaternary formations. The appearance and composition of these sediments can best be seen on the road cuts near the Danube banks and on the profiles in the wider area of the town. The Quaternary overlies transgressively the marine Upper Badenian. It is most manifest and best preserved north-west of the stadium. In the lower part it contains sands 2 m thick with the fauna of fluvial and terrestrial origin. Overlying them are loess sediments more than 10 m thick, containing terrestrial fauna. Abstract: The Lower Miocene deposits of the SW part of the Carpathian Foredeep show a recurrent cyclic arrangement. These cycles are typical transgressive/regressive cycles. Among many factors causing cycle stacking patterns two played a leading role: sea-level changes and the rate of sediment supply. The Eggenburgian and Ottnangian sedimentary record of the basin can be subdivided into several sequence stratigraphic units. Two sequences have been recognized within the studied area. Sequence I is formed by a succession of sediments forming segments A, B and C with their parasequence sets. Deposits of segment A are interpreted as lowstand/early transgressive deposits, segment B is formed by transgressive deposits and segment C by highstand deposits. Deposits of the falling stage were not described in the area under study but are traced more basinward. Within sequence II only one segment that is segment D (transgressive and highstand deposits) with its parasequence sets has been recognized. The morphology and different subsidence rate of various parts of the basin basement strongly influenced the thickness and development of recognized sequence stratigraphic units. Abstract: This paper describes the dynamics controlling the development of the Stiavnica stratovolcano and the distribution of related ore deposits during the Badenian–Pannonian (16.5–6.2 Ma) using combined structural, geobarometric and geothermometric analyses. During the early Badenian–earlier late Badenian (16.5–15 Ma) the Stiavnica area experienced NE-SW extension. It controlled NW-SE striking normal- and N-S trending sinistral strike-slip faults. Later, during the early Badenian–earlier late Badenian, the extension rotated to W-E and controlled N-S striking normal faults, NE-SW striking sinistral and NW-SE striking dextral strike-slip faults. Later, the extension rotated to NW-SE. The tectonic stress interacted with the rapid overbunden removal and magmatic stress of the granodiorite intrusion, during the late Badenian–early Sarmatian. The tectonic stress controlled NE-SW trending normal faults. Overbunden reduction input changed normal faulting to strike-slip faulting. Magmatic input caused the opening of subhorizontal veins above the intrusion and anastomosing fracture pattern around its boundary. Later during the late Badenian–early Sarmatian, the stress had a plane stress character (σ1 > σ2 > σ3), indicating neither collapse nor distinct regional extension. NE-SW striking normal faults, ENE-WSW striking sinistral and N-S striking dextral strike-slip faults were active. Normal faults and releasing bends of the strike-slip faults were places of ore deposit precipitation. During the Sarmatian–Pannonian (13.6–10.7 Ma), the stress progressively gained a strong oblate character (σ1 ≥ σ2 >>σ3), indicating strong regional NW-SE extension, controlling the same fault pattern. Later during the Pannonian, counterclockwise stress rotation towards N-S oriented σ1 and E-W oriented σ2 led to NE-SW oriented sinistral strike-slip faulting. Abstract: The microfacies of limestone pebbles from the Culm conglomerates of the Drahany Upland were examined in this study. The established groups of microfacies with similar features have been interpreted in terms of sedimentary environment and the content of facies of various age was analysed. For the pebbles of Upper Famennian-base of Middle Visean limestones, tha ratio of those facies which are interpreted as calciturbidites, hemipelagites and pelagites to the microfacies of shallower environments rises significantly in all Culm formations. No such facies were found in the pebbles of the Givetian-Lower Famennian and Middle-Upper Visean limestones. Comparison of the ratios of the limestone pebbles of different ages in Culm formations shows the decrease of Upper Famennian-Middle Visean microfacies in the direction from the older part of the Culm (Protivanov Fm.) to its younger part (Myslejovice Fm.). The analyses of the microfauna has shown that the pebbles of the Givetian-Lower Famennian and Middle-Upper Visean limestones occur in the eastern part of the Drahany Upland only. These trends in the content of the limestone pebbles of various ages and sedimentary environments in individual formations and their areal distribution are interpreted as a result of two processes: 1) progressive erosion of the sedimentary cover of the basement unit from its distal (pelagic and hemipelagic) through proximal (platform) parts due to foreward thrust propagation in the accretionary wedge of the colliding terranes; 2) post-sedimentary tectonic juxtaposition of the western and the eastern parts of the Drahany Culm. An advantage of the microfacial analysis of limestone pebbles is demonstrated for the regions where source-rocks were tectonically modified after their erosion and/or where the source-area was covered with younger sediments. Abstract: Dissolution of K-feldspar into Si-Al non-crystalline phase was identified in the kaolin deposit of São Vicente de Pereira (Portugal). The gel having a SiO2/Al2O3 ratio approximately equal to the unity, crystallized into halloysite-0.7 nm. SEM investigations carried out on K-feldspar grains show a vacuolar texture characterized by etchpits of various dimensions. The pits exhibit various shapes, either polygonal or circular. The gel was identified by SEM on the K-feldspar surfaces and by TEM in the < 2 ωm clay fractions. TEM images display tubes of halloysite-0.7 nm surrounding flakes of Si-Al gel. Relicts of K-feldspar pseudomorphs submitted to amorphization are identified by TEM. SAED analyses confirmed the non-crystalline state of the gel. Electron microprobe analyses attested a very fast destabilization of the chemical structure of K-feldspar grains. Abstract: The Hroncok leucocratic biotite granite represents a small intrusion located in the basement rocks of northern part of the Veporic Superunit (Central Western Carpathians, the Vepor Mts., Slovakia). The rock geochemistry, zircon typology and zircon Zr/Hf ratios reveal their A-type geochemical features and the higher degree of fractionation. Isotope U-Pb data yielded a discordia line with a lower intercept age of 238.6 ± 1.4 Ma (MSWD=1.2), which is interpreted as the crystallization age of the granite. 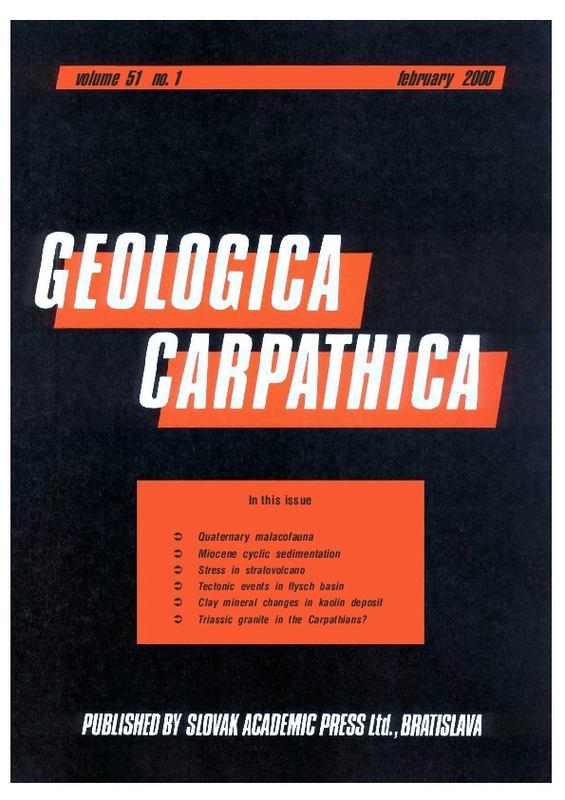 This result shows a younger magmatic event than has often been ascribed to the post-Variscan plutonic activity in the pre-Alpine basement of the Western Carpathians up to now. However, it is synchronous and geochemically analogous with the acid volcanism, products of which occur in the Veporic basement and its Permian-Lower Triassic cover rocks as well as within Triassic sequences of the Silica Superunit. All previously given examples of magmatic/volcanic activity are considered to be indicators of early Alpine continental rifting.